"Machine learning" and "neural network" are familiar terms to anyone who follows what Google is up to these days, but they may not be the most accessible or comprehensible concepts for the masses. And that's fine — you don't need to have a firm grasp of machine learning to enjoy better photos or keyboards, for instance. 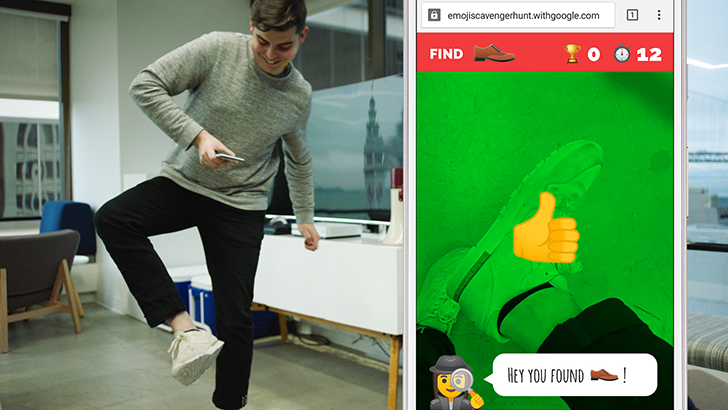 Still, Google has been quietly showcasing ways for users to get more hands-on with these concepts, and the latest such experiment is a game called Emoji Scavenger Hunt. Here's how it works: Once you open the game in your mobile browser and tap "Let's Play," you'll be prompted to grant access to your phone's camera (privacy-minded browsers like Brave or Firefox Focus won't cooperate). Once you allow camera access, you'll see a countdown and hear some cartoonish noises (turn up your volume if you don't), then you'll be shown an emoji that you have to find in the real world around you before the timer hits zero. With each emoji you spot IRL, more seconds will be added to the clock. The experimental game has a few quirks, of course: For one, object identification is far from perfect. In the few rounds I played, false positives were common. Also, a rather joyless sister of the Google Assistant narrates your hunt for emoji, asking aloud every couple seconds if its identification of the currently visible object is correct. If you stay focused on a single object for the entire duration of a round, it will endlessly ask if what it's seeing is [object]. Emoji Scavenger Hunt is amusing and well worth a spin, but it's not meant to be a well-polished game for mainstream play. Google's objective here is to show "how machine learning can be used in fun ways," and the player here isn't just you — after all, Google's neural network is doing all the guesswork. The experiment is powered by TensorFlow and doesn't access any servers, so Google doesn't capture or store anything seen with your camera during gameplay. For those interested in the ins and outs of Emoji Scavenger Hunt, the open-source code is available on GitHub. This is part of Google's AI Experiment showcase, which aims to make machine learning more accessible via simple visual and audible experiences.